New leads for senior living communities are generated via the internet and social media helps in keeping web activity strong. The Ehlers Group uses social media and search engine optimization (SEO) to effectively bring attention to senior communities and portray their unique lifestyle and brand. We understand that at the end of the day, we need to get the word about a community that is engaging, entertaining and informative. Social media is one of several senior housing marketing trends that offers a community an opportunity to share interesting posts, event pictures and happenings. SEO (Search Engine Optimization), an organic approach that requires ongoing work but delivers long-term value and rank momentum. PPC (Pay Per Click) can deliver high rankings quickly and help you jump the “directories” yet requires ongoing expenditures to ensure visibility. Online advertising campaigns that drive direct response through geotargeted rich-media banners aimed at behaviorally targeted prospects who are ready to buy what you’re offering. Search marketing programs that engage all the top search engines, directories and specialty sites, putting your brand and message in over 98% of the places consumers search. The Ehlers Group social media services include Facebook, LinkedIn, Twitter and Pinterest. We work with each community individually (your marketing director, activity director, etc.) to develop customized unique posts on a consistent basis. Facebook A Facebook page offers senior community’s many substantial benefits. 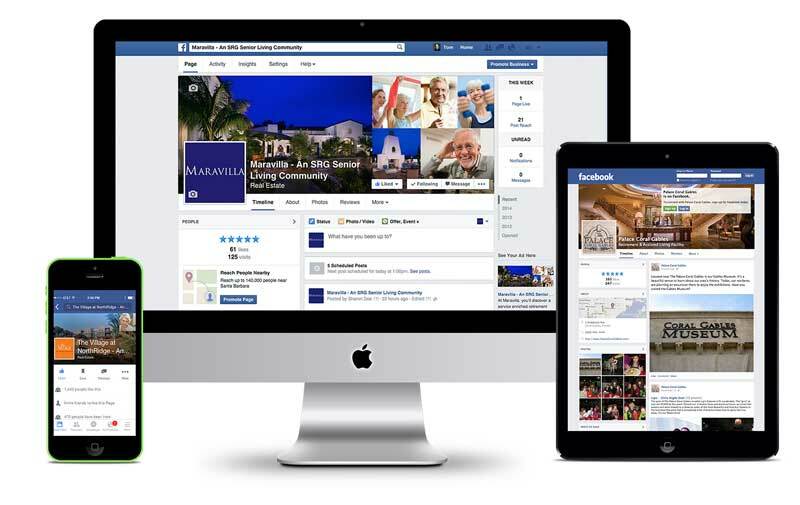 It’s a low-cost marketing strategy that gives a community’s its personality and offers an effective way to highlight staff, events, activities, residents and any aspect that is likely to attract other Facebook users and create interest in your community. The Ehlers Group understands the value of engaging content and the importance of consistency. We take the burden off of our client. We take advantage of targeted Facebook adverting too to raise community awareness. Blogs Where your brochure and website leave off, blogging fills in. Blogs keeps your website fresh and gives the potential customer a reason to return to the community’s website. When linked to the community’s Facebook post, blogging reinforce messages and keeps communities visible. Blogging separates you from the competition. The Ehlers Group is a content expert and will write your community’s blogs utilizing metatags and keywords, adding an additional dimension to your website and social media.